What a night! 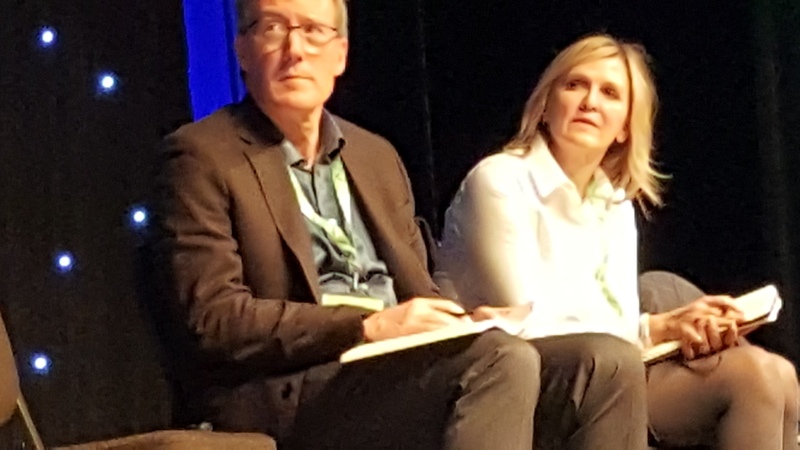 Before the chat began Paul Hankins suggested that our theme song might be Petty’s “Free Falling” and as it ended Colleen Cruz talked about re-reading the stream “…to bask in the glow of @pennykittle and @KellyGToGo.” Either celebration would be so appropriate for that hour in time. 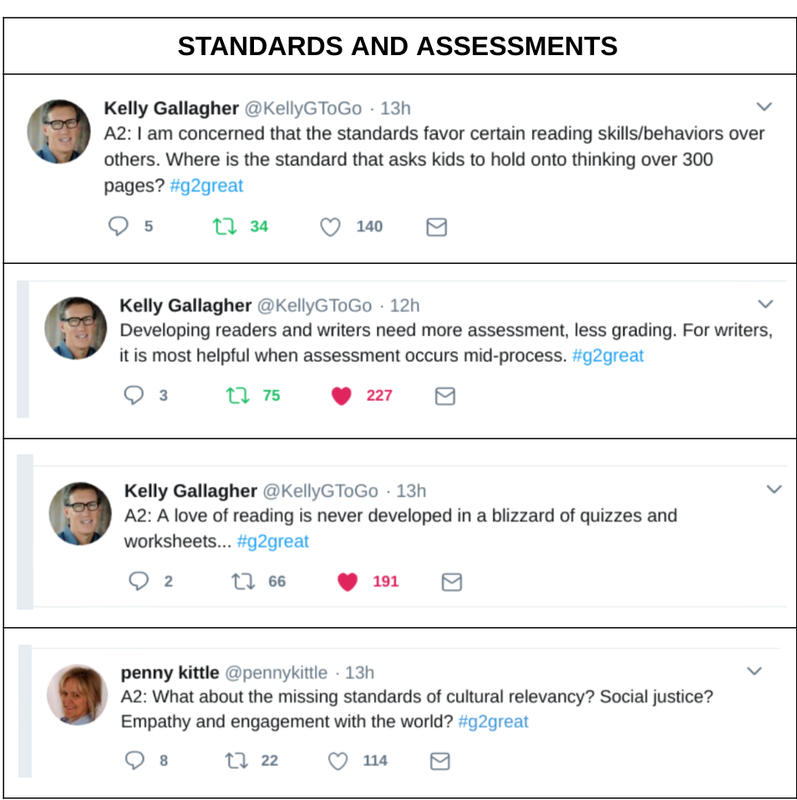 Less than ten minutes was all it took for #G2Great to trend in the top “3” due to the wisdom flying through the twittersphere so I knew narrowing down a focus for this post was going to be a challenge as Kelly Gallagher and Penny Kittle joined the #G2Great chat table for their first time on May 17, 2018 to discuss 180 Days: Two Teachers and the Quest to Engage and Empower Adolescents. I first heard about this book last November at NCTE 17 from a panel presentation consisting of Nancy Atwell, Kelly Gallagher and Penny Kittle. The chair for the panel was Nancy’s daughter. Her introductions were fabulous. Each one was better than a five paragraph essay – well constructed and so thought-provoking. I was mesmerized. I was entertained. I was so curious. In that session Kelly and Penny shared the overview of their collaboration and I knew instantly that this was a book that I could not wait to get my hands on. But it wasn’t just the content of their presentation. I was completely awestruck by their behaviors. When Nancy Atwell went to the podium, Kelly and Penny (seated on stage) took out their notebooks, poised to write and then did write throughout Nancy’s presentation. I was so amazed by this that I tweeted out a picture that showed them, on stage, writing while Nancy was speaking. Then when it was time for their part of the presentation, it was no surprise that at times, they finished each other’s sentences . . . truly collaborative partners. Here’s the picture and a link to a brief description of their session. Many may think this is a book only for secondary ELA teachers. I would recommend this book to EVERY literacy coach, curriculum, and/or department chair in the district as well as every administrator. As the lead up to this chat, I wrote a blog post on Tuesday with many of the links listed at the end of this post. I also watched Twitter comments during the week, and then Brett Whitmarsh, (@HeinemanPub), posted this podcast the morning of the chat. It was a read aloud by Kelly and Penny. A read aloud of text that I had read twice before. A read aloud that I have listened to twice. The depth of my knowledge after multiple readings and listenings cannot be measured objectively, but I can tell you that the “story” behind the text and my connections to the text have increased exponentially. I will probably listen once more as I continue composing this piece. I didn’t annotate the text, I didn’t take copious notes. I really worked on “holding my ideas” across the text with some jots and post it flags as I “spied” on my own reading in hopes of finding the big ideas. And then came the chat. The two areas from their book title that continue to fascinate me are both “engagement” and “empowerment”. Do you know high school students? Do they routinely feel engaged? Do they routinely feel empowered? How does this play out in real life with the students that Kelly and Penny have in California and New Hampshire? When students are engaged, teachers and students will be able to dig into deeper levels of understanding. Core beliefs found in their previous books, like Book Love, by Penny and Readicide by Kelly share foundational thinking for their literacy instruction but 180 Days: Two Teachers and their Quest to Engage and Empower Adolescents provides the nuts and bolts about what this really looks and sounds like in classrooms. Then you will discover their ideas on how to accomplish it. This is simultaneously overlaid with the WHYs so that you can follow the thinking that drove all of Kelly and Penny’s decisions. If students have choice, some teachers believe it feels “loosey-goosey” and seems like “free falling” because the teacher cannot plan out the year during back to school workshop days. As I read back through the Wakelet, I identified three themes that I felt supported “Engagement” in our chat. We will be hearing more about engagement in two weeks when we discuss Ellin Keene’s gorgeous new book, Engaging Children: Igniting a Drive for Deeper Learning, but for now the themes of Joy, Reading and Writing Lives, and Standards and Assessments from Kelly and Penny’s tweets support increased student engagement and helped me organize my thoughts. 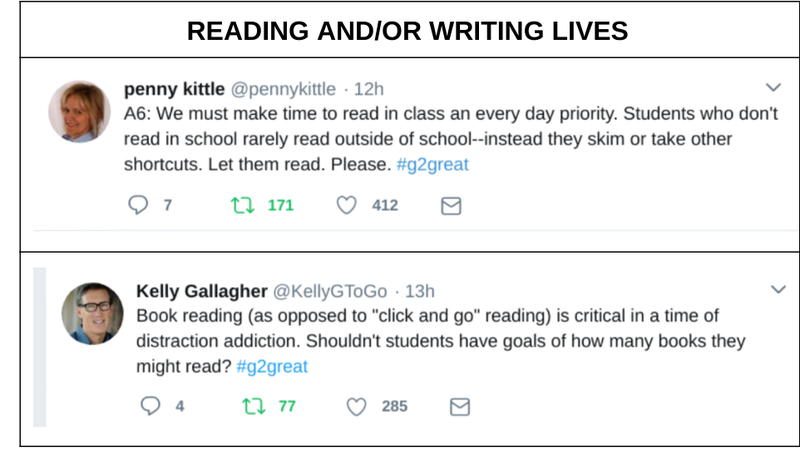 Do note that I deliberately left in the number of retweets and likes so that you can see how the #G2Great chat members (and or other friends within the first 12 hours) responded to this wisdom. Which tweets stand out in your mind? Which ones would you like to continue a conversation about? Empowerment is the second promise from the authors. What does empowerment mean? Again, students who feel they have choice and voice in their daily lives will feel empowered as well as able to reach a higher level of engagement. The two elements are not easily separated. The curriculum allows students to strengthen their reading and writing skills. The daily framework for instruction allows students to be more successful with less “push” and “scaffolding” by the teacher. Knowing that half of their time during the year will be spent on self-selected books is empowering. Respecting students’ lives outside of school is also empowering for students as it reduces external stress in their lives. The clearer the learning targets, the more efficient and effective the instruction becomes. The clearer teachers are about their belief systems, the easier they can articulate the relevance to the students. And yet, truly empowering adolescents will require change in the actions and work of students as well as teacher’s roles. Students will have the power to control their learning within the class. The teacher’s role will be reduced as students take the lead in discussions and book club work. This is not work for the faint-hearted. Students will resist in the beginning. Because the WHY should be guiding all decisions! 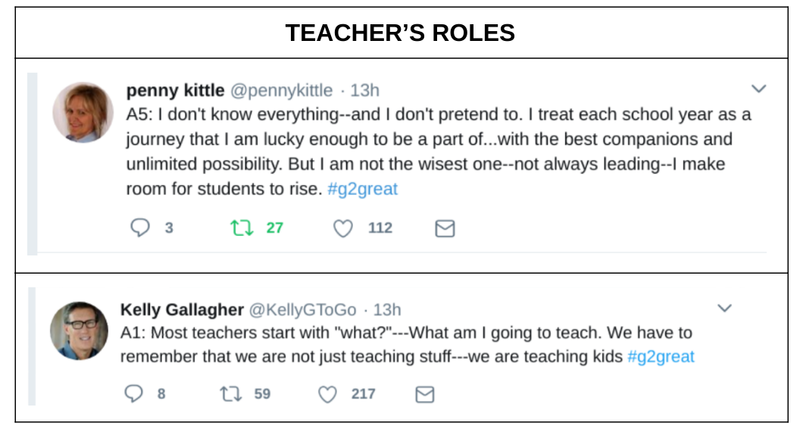 Specific tweets from Kelly and Penny that supported “Empowerment” seemed to fall into two categories: Actions and Work of the Students and Teacher’s Roles. When students are empowered, there is no need for “fake” accountability systems. Students meeting in book groups with students across the country were interested in completing their work in order to be a part of the cross-country collaboration. Note particularly what one of Penny’s seniors said as reported in Penny’s first tweet below. The chat revealed that Kelly and Penny originally began with 20 core beliefs and they did whittle it down to 10. Their schedules provide for daily reading and writing. Kelly (from the book and a live PD session last week) has 10 minutes of reading and writing every day. Time matters in terms of how it is used each day, as well as across the year and throughout the secondary careers of our students. and a trillion seconds equals 31,688 years. Seconds do matter! A sense of urgency is needed! Being responsive to our students does not mean employing a whip and timer for every time segment in class, but it does require that we pay attention to the balance of time and not waste precious minutes that take away from student application and transfer of reading and writing. At all grade levels. With all students. Those are non-negotiables. The videos in the book are priceless. I remain impressed with the collaborative nature of this work. The need to have another professional to discuss your ideas with, to plan together, to teach in each other’s classrooms. How can book clubs meet virtually in California and New Hampshire? What do students (used to sun and sand in California) who may have never seen snow fall from the sky have in common with students from New Hampshire who ride snowmobiles to school in the winter? What will YOU do to engage and empower yourself, your peers, and your students? How do YOU fit it all in? Thank you for organizing the essential messages from Thursday’s Chat w/Kelly and Penny. It was refreshing to read your reflection. I’m excited to dig into reading 180 Days and discuss it with others during the summer book club. Thanks, Patricia. There is so MUCH more in the book. I can’t wait for summer book clubs as well as there will be some lively conversations as well as a few “But . . .” as well. Change is not easy. But understanding a framework AND the thinking and purposes behind it will really stand you in good stead! 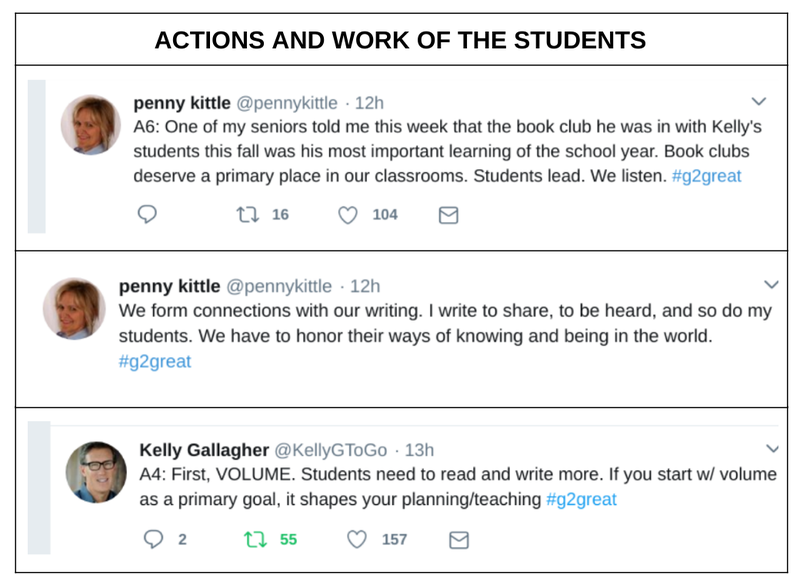 Penny Kittle and Kelly Gallagher have given us nothing short of a celebratory gift in 180 Days – and you have managed to capture this gift in all of its essence Fran. You are so right in your comment above:”Change is NOT easy.” But this book will offers a powerful roadmap that will help teachers everywhere at ALL grades to maneuver that change process. And I can’t think of a more worthwhile journey!